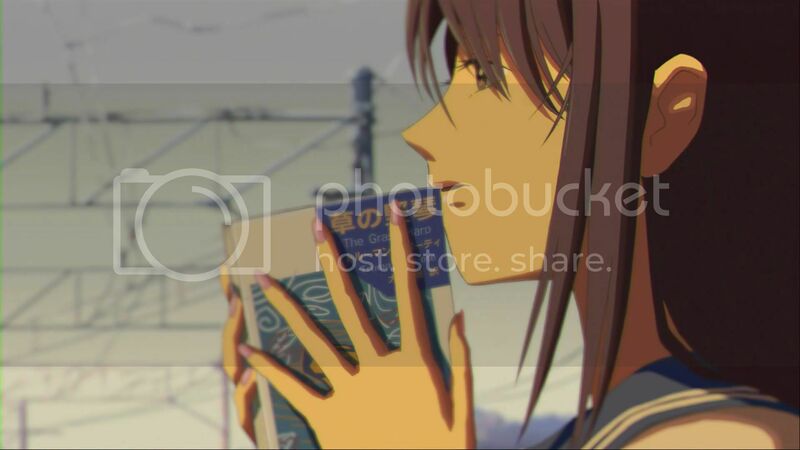 The above is a screenshot taken from the Blu-ray disc in Full-HD (1080p) version of "5 Centimeters Per Second" (秒速５センチメートル). Due to the amount of detail (or the lack of), the size of this screenshot is about the same as that taken from a 2-megapixel camera. Due the HD standard being commonly being started broadcast in Japan, South Korea, North America and Europe barely a few years ago with Blu-ray defeated HD-DVD discs just months ago, older standards like NTSC (640x420; VGA) and PAL, both with the 4:3 aspect ratio, are slowly being phased out, but still common, as proven by analog broadcasting still around and 4:3 ads appearing in the middle of a 16:9 show like the image to the right of this paragrapth.Unfortunately, except for my laptop and the widescreen TV in the living room, I don't have anything that can display or plaback videos of any HD resolution (unless you count the 2005 PC with a 128MB video card, but its motherboard got fried shortly after I had the laptop in 3Q 2007). Even with these two, it's not posible to play at HD resolutions any higher than 720p (not sure about 1080i) without downscaling or lag issues. If you are not sure what difference between High Definition (HD) and the older standard (SD), it means being able to see more detail over the same given area. (In computing terms, the image is actually larger) This is more noticible over larger screen. Use the 2 images on the left and below (on the right if your screen is wide enough) to compare the same scene but at different resolutions. Click on the image to enlarge.